*Sunfire (Shiro Yoshida): Sunfire is a temperamental and arrogant mutant from Japan. He was born a mutant because his mom suffered from radiation poisoning after the atomic bomb hit Hiroshima. Shiro’s mom died from the radiation poisoning and as a young adult, Sunfire vowed revenge on America. 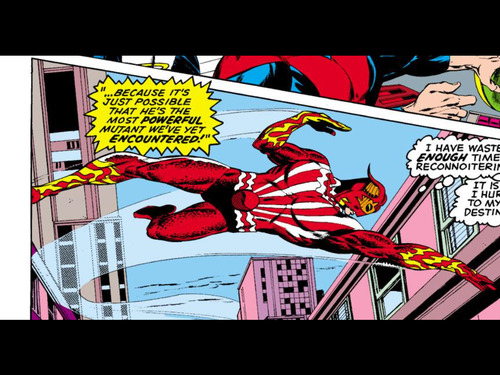 Sunfire has been a member of the X-Men for brief periods throughout history, but never for very long. He is now a member of the Uncanny Avengers. -Powers: Sunfire has the ability to absorb solar radiation and convert it into fiery plasma that bursts into flame when it comes into contact with oxygen. He shoots these flaming beams with his hands. He can also use these flaming beams to fly. This issue begins with a mysterious named Mutant attacking a ceremony where a statue promoting peace between Japan and America is being unraveled. After Sunfire destroys the statue Angel, Beast, and Iceman try and subdue Sunfire but they are defeated. We then find out that Sunfire is a Japanese man named Shiro Yoshida. Shiro returns from his act of terrorism to his uncle who angrily reminds the villain why he is here. Sunfire’s mom was killed by radiation poisoning after the atom bomb was dropped on Hiroshima and Shiro and his uncle have vowed revenge on Americans ever since. When Shiro developed powers, his uncle trained him to control them and also conditioned him to hate America. We then discover that Shiro is the son of Saburo Yoshida, a Japanese dignitary who is trying to strengthen American-Japanese relations. Saburo no longer hates the Americans and Shiro hates him for this. 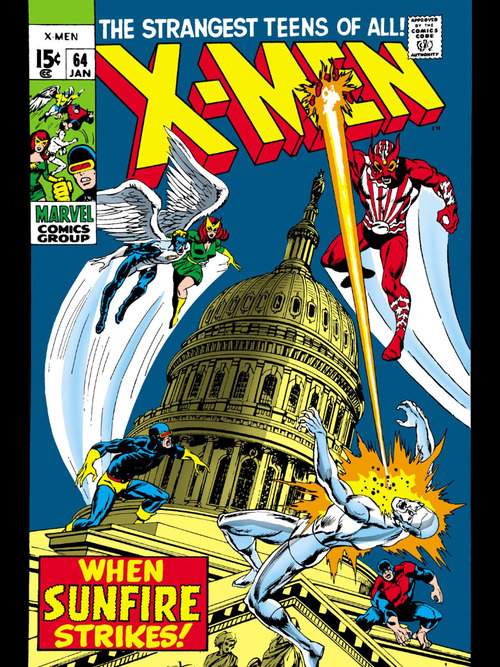 When Sunfire tries to disrupt his father’s diplomatic meeting with the White House, the X-Men are there to interfere. The X-Men try their best, but Sunfire is able to overpower them. The story comes to a climax when Shiro’s father confronts Sunfire and tells him he needs to stop being so angry about a war that is long over. 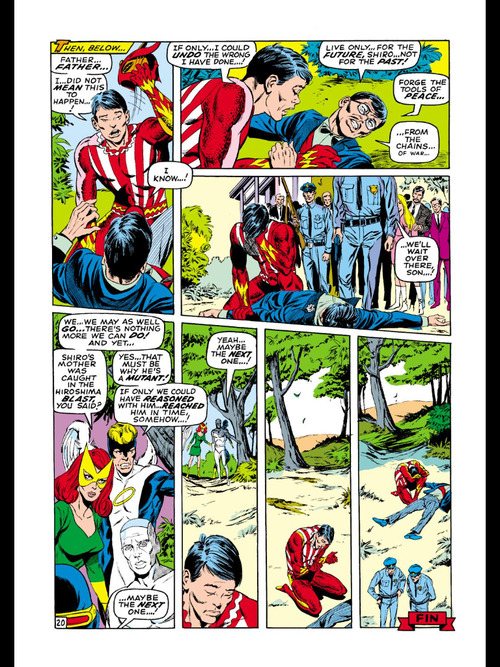 Sunfire begins to have doubts, but he is in shock when his uncle shows up and shoots his father. Sunfire than kills his uncle with a blast of his plasma beams and rushes to his father’s side. Shiro’s father’s dying words are “Live only for the future, Shiro, not for the past. Forge the tools of peace from the chains of war.” The issue ends with Sunfire mourning his father’s death. This issue is more of a Sunfire origin story than a standard Uncanny X-Men story, but I loved it. I understand all of Shiro’s motivations. Since Shiro’s mom was killed by the war, it would be very easy for Sunfire’s uncle to breed hate within him. His inner struggle when his dad confronts him also seems genuine and leads to a powerful page. 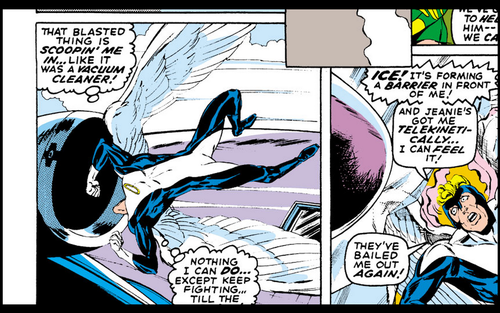 I was also heartbroken when Sunfire’s father died. It was a very moving final page. It was not overly dramatic, but it gave Saburo’s death the emotional weight it deserved. My biggest problem with this issue is that Jean is reverted back to some sexist actions in this issue. 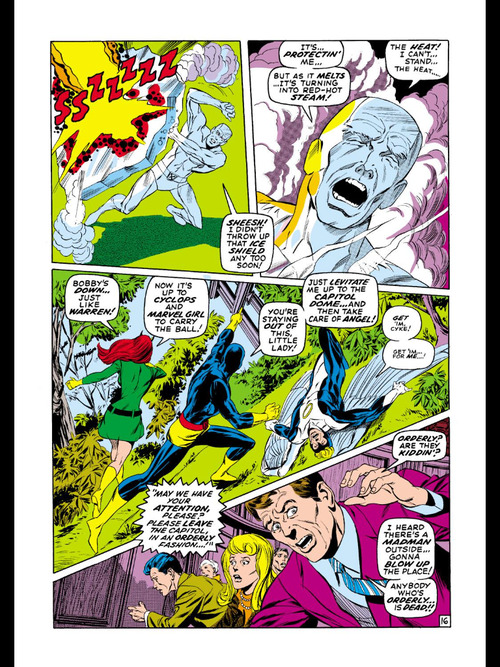 Her and Scott are not able to help the rest of the X-Men in their first battle with Sunfire because they are shopping. 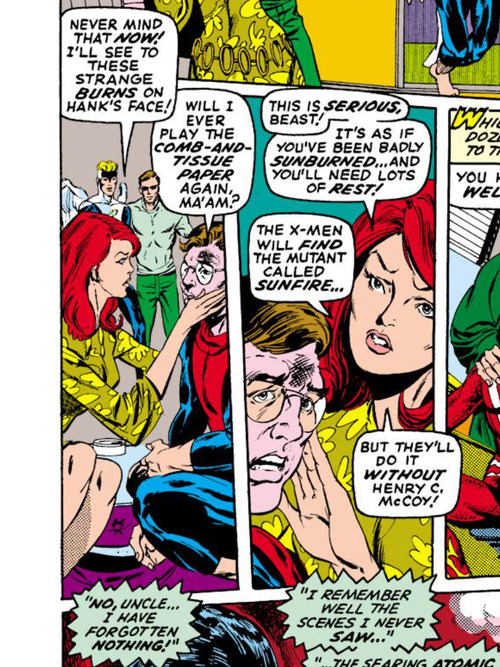 Also, Jean offers as the team nurse like she tends to do when Beast is wounded by Sunfire. And in one more sad insult to Jean, Cyclops calls Jean a little lady and tells her to stay out of the fight. My only other problem with this issue is that the X-Men don’t really do anything in this story besides get beat up by Sunfire. However I don’t mind this because Sunfire’s story is so interesting. This issue was a nice break from the usual mold that Uncanny X-Men issues follow. This issue did a very good job at making me feel strong emotions for a character that I had never really read much about before. Sunfire’s story is easily relatable and a great read. Even though I don’t like how Jean is portrayed in this issue, I still loved it. Usually this portrayal of Jean would make me mark down my rating, but this story is really great. 1. Every new villain the X-Men face is always the “toughest” villain they have ever faced. 2. Angel must be pretty weak if he can get sucked into a plane’s engine. This is probably Thomas’ strongest writing on the X-Men. Angel almost got sucked into a jet engine. Yeesh. Haha o yeah I meant to add that panel with Angel but I forogt. I’ll add it now! Priceless Angel being terrible panel. Also very true about Thomas’ writing. Well, isn’t he supposed to be super light, like his bones are actually lighter than an average human? Well, technically if every next enemy is more powerful than the last, than every new enemy would be the toughest they’ve ever faces. But the drama in there would be lost if you did that to often. That is true, but they definitely overuse the hyperbole. I remember a Spider-Man story where he ran into Rocket Racer (guy on a jet-propelled skateboard) and proclaimed him “the most dangerous, powerful foe I’ve ever faced!” I still laugh about that. Hahaha wow that is the perfect example of how comic writers exaggerate villains. And yes, absurdly sexist on Scott and Jean. 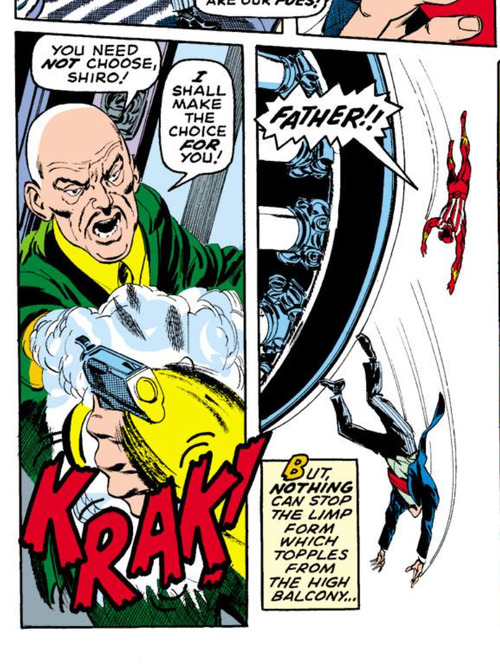 Remarkably good art for Don Heck–Buscema’s inks really helped. I agree the little lady comment is sexist. But not the shopping. Scott and Jean were both out shopping. How can that be sexist? 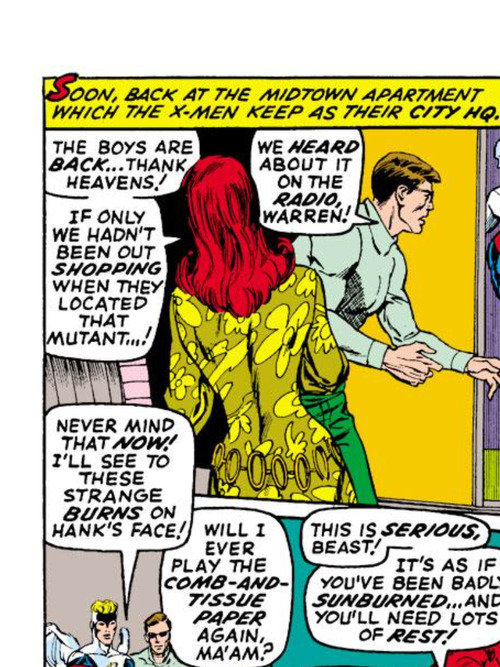 Arguably, with Xavier dead Scott and Jean have become a bit parental. Maybe they went to get some groceries! It’s not like Scott’s holding a dozen shoping bags filled with dresses. Even the little lady comment’s just a sign of the times. Look at how Cyclops is always condescending to the other male X-Men, too (“son”). It’s a bit off putting. 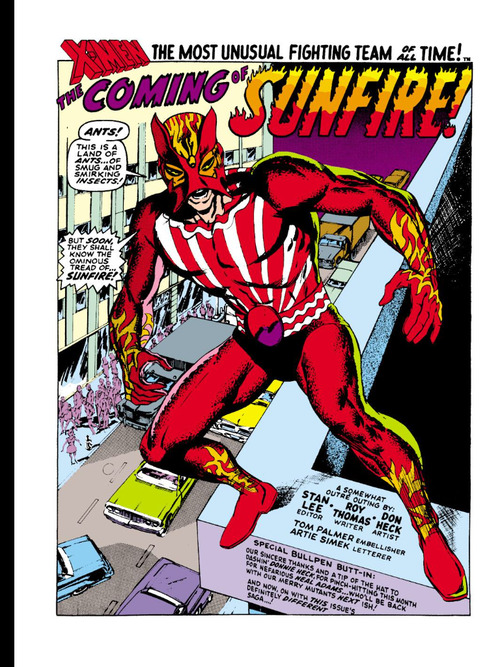 Sunfire has always been a hothead! ( if you thought I could resist that one, you don’t know me!) it has to be noted that there is a great difference between our world and the Marvel one; of all the hibakusha, the Japanese radiation survivors, there have been no mutants with great desirable powers; whereas they seem to crop up all the time in Marvel! Yes, they hype every encounter; “the most dangerous, powerful foe”, etc. All told, Sunfire doesn’t come anywhere near Magneto, for example. But the publishers are trying to get you to buy THIS comic, so they hype this one, and then they have to get you to buy the next one, and so on. The only thing that makes it just slightly believable is that you have to think that everyone, heroes and villains alike, are constantly getting stronger. Some add entirely new powers, but most just get stronger at what they do, or they work smarter. My late brother used to complain about a sportscaster named, if memory serves, Keith Jackson, who used to annoyingly hype every event he covered. After a while, you learn to discount this stuff, but it sure doesn’t make sense if you think about it! Yeah I skim over all of the hyperbolic language on the covers of comics and in the first few pages now. Sunfire seems interesting, though mysterious, in Uncanny Avengers. As I was reading your review, I looked back on the date that this story was published to get some idea of how long after WWII this is taking place. It seems like a really interesting story, perhaps an attempt to show some international mutants and have some commentary on historical events, which is something I enjoy in stories. Yeah Sunfire is really interesting. And I like that he finally gets more panel time with Uncanny Avengers. Sunfire was definitely the beginning of an X-Men trend of diversity that really picked up in the Claremont era. The diversity of the New X-Men had to do with international sales. I wonder if Sunfire was, too, or if he was just another character, like Banshee. I wish Remender did more with Sunfire. He’s never been fully realized for me. He’s still the a-hole Japanese guy, pretty much. I’d like to see a more dimensional take on the character. He could be an A lister. They should put him in a movie!